September 18, 2015 September 18, 2015 by Christina - Wear Out There, posted in Tips and Tricks, Take Your Look to the Next Level. Are you ready for fall? My column in this month’s Community Cord talks about trends for the upcoming season. It may come as no surprise that fall fashion makes my heart skip a beat. With the return of layering, rich textures, and classic styling, there is no season more enjoyable to dress for. If you’re back to school, or simply coveting a fresh look, this year’s trends do not disappoint. Remember, style is much more important than fashion. Use trends as inspiration, and before you incorporate any into your wardrobe, consider the following: Do I like it? Does it suit me? Does it express my personality? While I may buy a new coat, bag or blouse, the essence of my style this season will remain the same. What can you expect to see in our local boutiques? 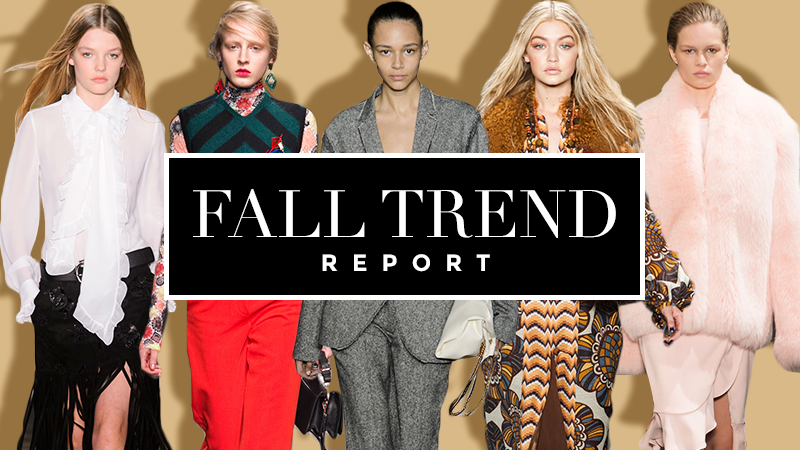 Here’s a look at fall trends. Return of the 70’s: This decade returns year after year, in a slightly different way. Full flare hems, colourful suede, and crafty details like patch-work jackets are driving the looks for fall. If 70’s styling is your thing, pick up some genuine articles locally at vintage boutiques like Auburn Vintage. Eclectic looks: Mix floral prints with edgier pieces, for a high-class meets bad girl look. This trend is all about making you stand out in crowd. Suede and Fringe: Tweed is out and suede is in. These pieces take on every form from fitted equestrian-style pants to classic blazers. Adding fringe to a look will take it to the next level. Romanticism: Embroidery, high collars, velvet and lace took the runways by storm. Dark, haunting romantic pieces, with gorgeous detailing are right on trend. As is typical for fall footwear, it’s all about boots. This year’s crop consists of mid-calf, Sorel-style boots, snake-patterned knee-highs, and leather or suede over the knees. A structured tote bag is the most stylish accessory this season as well. For colours, we’re seeing grey (pearl, charcoal, and dove shades), pink in all its forms, purple (iris, and amethyst), and pops of yellow taking centre stage. For a limited budget, but large style boost Fashionista.com suggests adding these 5 pieces to your wardrobe in a trendy form: wrap dress, turtleneck, pleated skirt, high-waisted pant, and midi dress. Fashion is fun, but above all else, clothes should be used to enhance your personal style. When I look at trends, I view them as a source of ideas rather than a strict set of rules to follow. Not all trends work for every body type, which is perfectly okay. There is no benefit in wearing something trendy, if it makes you uncomfortable in your own skin. Highlighting your best assets is the goal of proper dressing. You can be fashion-forward, and only incorporate an element of a trend into your wardrobe. For example, if you love florals, but don’t want to wear them head-to-toe as suggested, buy a bag, shoe, or blazer. Style is about knowing who you are first, and then dressing accordingly. For more details on fall trends, bookmark www.style.com, a fantastic source for the latest runway looks, fashion stories, and street style photos.